London's West End is on par with New York's Broadway theater district when it comes to top quality big budget theater productions. But with the US Dollar at 2 per pound Sterling, the tickets are outrageously expensive for Americans. Tickets to a standard seat at a London musical performance costs around £50-60, so you'll end up getting hit for $100 or more per person! Just like in NYC, most London theater productions will offer up discounted tickets, if you know where to look. The ones that don't are usually book every day for weeks on end and if you really want to see the theater play or musical, you'll have to pony up the money. For discounted theater tickets (while in London, these are often referred to as half price theatre tickets) there are a few websites that dig out the best deals for your buying pleasure. Use these sites to find the right discount code and then book the tickets yourself. Theatermonkey.com lists many half price promotions and theater and dinner packages. Broadwaybox.com mostly covers New York theaters, but also publishes discount codes for West End theaters. If you're willing to crane your neck around, older theaters have 'restricted view' seats on sale. This means some part of the stage is hidden from your normal seated position, so you might miss moments of action. The seats are much cheaper and you can check out Theatermonkey.com for reviews on these seats. Some are cheap but so horrible they're not worth the bother! If you're not completely set on the West End theaters, you can find smaller theaters in the 'Fringe', which is what Londoners call theaters outside of the Theater District. 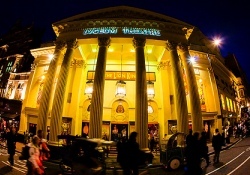 At the Fringe theaters, tickets go from a bargain £5 up to around £30. The Fringe does see a lot of top English stage talent as it's a very valid career path and it's also used to test out new productions before their big West End debuts. 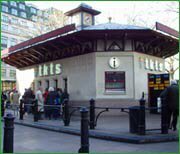 Should you need a ticket at the last minute, there's also the TKTS booth in Leicester Square where tickets are literally half price and stagings on offer include dance performances as well as theater. There's a Manhattan ticket office like it, which is actually older, but the London one accepts both credit cards and cash, so it's a bit more convenient. So, there you have it, a comprehensive guide to cheap theater tickets in London. Last updated by jack on 23 July, 2008 in Travel.